Sable Mountain Lodge is a fabulous base from which to explore the Selous Game Reserve. Its en-suite tented bandas and stone cottages are built on a hill with stunning views over the Uluguru Mountains. It is just outside of the Selous Game Reserve and game viewing takes place inside or just outside the park. You can choose to take a picnic lunch and head off on a full day game drive in the park, perhaps to Lake Manze or maybe to Lake Tagalala to include a boat safari. Selous is the largest reserve in Africa and offers exciting wilderness and wildlife experiences yet it remains one of the least visited of the great game sanctuaries on the continent. You can also go on walking safaris and, if you want to get to know a bit about the local people, you can be taken to a local Maasai village. This is really non-touristy and a delightful, as well as insightful, experience. If you want to experience the bush in depth, you can go fly-camping in Selous Reserve, where you stay deep in the bush and sleep on platforms under the stars. Apart from the excellent safari experiences you can expect here, the lodge is a welcoming place offering good food and friendly service, a swimming pool, comfy beds and hot showers. We get really good feedback about Sable Mountain, which is why we recommend it. Open: Sable Mountain Lodge is open from the beginning of June till the end of March. Location: The lodge is situated over several hills in the far north west corner of Selous, the boundary running right through the camp. The lodge is on land owned by Kisaki village. It is 9km from Matambwe Gate. It is set in deciduous woodland and is very overgrown with lush high grass and plants in the green season, becoming drier as the dry season continues. There is an airstrip a 30 minute drive away and the flying time from Dar es Salaam is 50 minutes. You can also travel by train from Dar. The train runs twice a week, Tuesday at 3.50pm arriving 8pm and Friday departing 2pm and arriving 7pm. Staff from the lodge will collect you and drive you the 30 minutes to the lodge. Rooms: There are 8 stone cottages and 5 tented bandas, including 2 honeymoon tents, all en-suite. The bathrooms in the tented bandas are slightly larger. There is also a villa with 1 twin and 1 double room and a shared bathroom, good for families or groups of friends. Atop the villa is the Rooftop, a double room with great views of the surrounding landscape. Activities: Game drives and boating safaris in Selous Game Reserve. You can take full and halfday game drives. The full day often includes a boat ride on Lake Tagalala. You can go on a 2-hour guided walk from the lodge, take a tour of Kisaki village and the nearby Maasai village. Facilities: The lodge has 2 restaurants a bar, the Landrover's Return. There is a small library and sitting area. There is a covered freshwater swimming pool overlooking the waterhole. You can use the safe in the manager's office for valuables. Batteries can be charged in the bar area, restaurant or office. Dining: Meals are served in either of the dining areas, weather dependent. Breakfast includes cooked dishes, lunch is usually 2 courses and dinner a 3-course meal. Children: Children aged 6 years and over are welcome, and younger children will be considered at the discretion of the manager. Communication: There is a limited mobile reception, no direct phone or fax and no internet. Notes: Due to the uneven, sometimes steep paths and number of steps, Sable Mountain is not suitable for those of limited mobility. The local community land owners are given bednight fees and lease payments for the lodge. The owners are also very committed to the welfare of staff and the local community. For example scholarships have been provided for some local children to go to secondary school. There is solar power. "Absolutely beautiful. We stayed in the tented bandas which was a great experience. Staff are all fantastic we loved the little touches such as fresh drinking water in our room every day and a cold flannel after a long safari. Food good overall but really enjoyed Africa style dinner." "One of my favourites, this lovely camp is set on the side of a mountain with views across the valley to other mountains. My tent was extremely comfortable and quite elegant, and the view from the balcony was mesmerising. Food was fantastic, the staff cheerful, friendly and knowledgeable. The early morning walking safari was superb, and I'd return here like a shot!" "A great place with great people and great food just outside the reserve. From the room, we had a great view on the bush and we enjoyed the bush concert every night and morning. The staff is so friendly and helpful and the food is delicious. The Selous reserve is very beautiful and full of wildlife. Even without the wildlife it's a beautiful place. 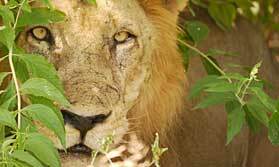 We didn't see any other tourists while on safari, because the lodge is well located a bit further from other hotels." "Good location although outside the game reserve and very friendly staff and manager. The boat safari was a great experience." "Great introduction to Africa, and very friendly. location outside the reserve meant longer drives to get to the heart of the reserve. Cultural exposure to the Masai village was fascinating and very worthwhile."